Dear Engaged Couple, I have a new/old venue to recommend to you if you are wanting to marry in the Charlottesville area—an area replete with vineyards and breweries, and of course, sightseeing places like Monticello and the rotunda at UVA. 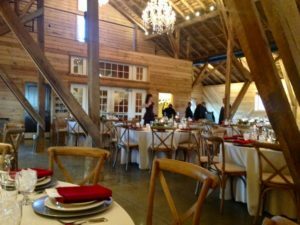 Mount Ida Farm in my book, is quickly becoming one of the most sought-after wedding venues in the area. THE place in years past, has been for brides to marry out-of-doors, near a pond. There is a dramatic expanse of steps leading to a gazebo by that pond. It is inside that gazebo that I have married many a couple. 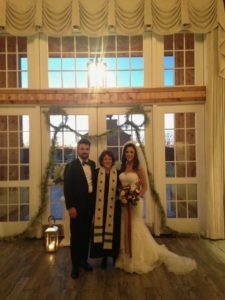 But, Mount Ida also has a barn that is ideal of receptions and smallish weddings—it is a converted horse barn, but with all the amenities available for human celebrating. Recently, though, a new facility has opened at Mount Ida—called the Lodge. That’s what I want to share with you especially in this blog. I officiated at a winter wedding there. 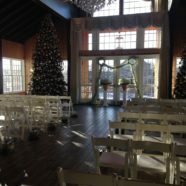 It was well-designed just for weddings—with a ballroom, a dining room, several bathrooms, and a platform off the ballroom with the many electrical outlets needed for musicians and/or disc jockeys! Finally, and as you might have already hoped, there is a large, well-equipped kitchen off the dining room. But that is STILL not all! 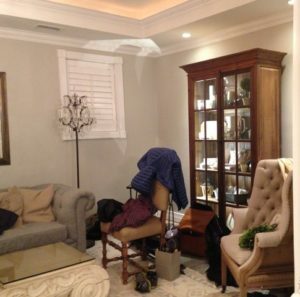 There is a dressing room downstairs for the women (and bride) and one upstairs for the men (and groom). Since it was dreary winter day when I officiated at the Lodge wedding, we all stayed inside, but the lodge does open to a handsome patio area—a great place for sipping cocktails when the weather is right. There is a large, flat expanse of land within walking distance of the Lodge, for outdoor weddings, too! I went a little overboard taking pics. Hope you find these of interest. Check out Mount Ida—especially the lodge!